In a medium bowl, beat softened butter with granulated sugar until fluffy. Add lemon zest and almond extract. Mix well. Pour half beaten egg into the butter mixture and beat well, then add the other half, continue beating until even. Add flour into the butter mixture, stir until all the flour is gone to form a tart dough. Divide the dough in half and scoop into two 4.75" round tart pans. Flatten out the surface with the back of a spoon. In the meanwhile, crush the graham cracker into powder. I used an electric food chopper for this step. A food processor will work too. In a medium bowl, fold graham cracker powder and powdered sugar into cream cheese. Mix well. Add whipping cream, beat until smooth. When the tarts are ready, let cool. Divide the frosting in half and frost two tarts respectively. 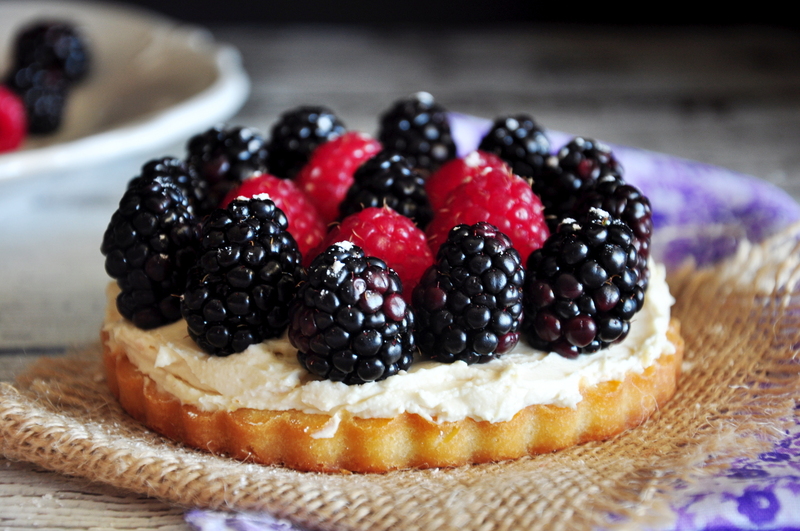 Top with berries and garnish with powdered sugar. Enjoy! 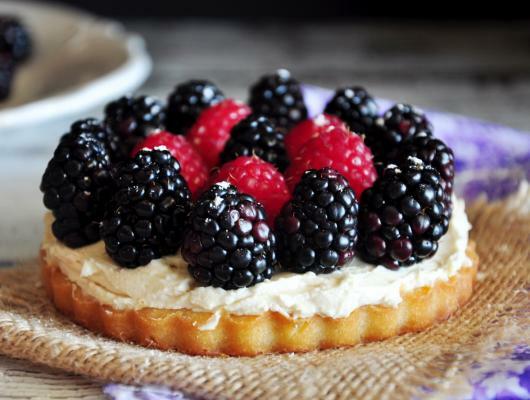 The tarts are the only part that requires baking. They are sweet, soft and crisp. They taste light and refreshing. They offer the aroma of almond, lemon zest and rum at each bite. So good!